It had been a particularly rough 12 months for our family. My father was terminally ill, one of our children had additional needs, which required at least one therapy session a week, and my husband had had an incredibly stressful few years at work and had just changed jobs which necessitated that we move to a semi-rural suburb on the edge of Sydney. I was physically and emotionally exhausted, but our change of location brought with it some wonderful benefits. We were on a large block of land by suburban standards and rather than being surrounded by 6 foot high fences, our property boundary was marked by chicken wire held up by neatly spaced stakes. We had an uninterrupted view into our neighbours yard, complete with a sweet little staffy dog, a small tractor and two horses. Much to our delight—the horses were stabled right beside our fence line. I quickly became friends with our next door neighbour. Her name was Chris. She had been a nurse in a busy Sydney hospital but, in her 40’s, she left that career behind to take on a quieter existence. She earnt a small income as the ‘photocopying lady’ at a local private school and spend her afternoons tending her property. Just before five p.m. everyday, she would be out with the horses and I would often meet with her for a chat over the fence. She was full of wonderful wisdom about ‘country-etiquette’, gardening plus motherly advice and support. One of my children was going through a particularly rough patch and she often heard the tantrums and meltdowns through the open windows of our house. She would ask me how I was coping with motherhood and chat with me about the challenges my children were facing. She never judged, she always listened. We just chatted, sometimes even as my child was wailing and stomping by my side. I was so, so tired. Some days I just couldn’t give my children the time and attention they wanted. Sometimes their wants and needs took me totally by surprise. And sometimes, those screams and tantrums just kept tumbling out of my children, one after the other. As much as the fresh country air and slower lifestyle helped me, it still wasn’t enough to quell the anxiety and depression that I had been battling as a result of the events of the previous year. The crisis point came when I suffered a minor nervous breakdown. I was overwhelmed with life, with the things we had come through and with the uncertainty of the future. I ended up in bed for two days, on a steady diet of lemonade icy poles, staring at ABC 24 and unable to engage with my children. When I finally got up again, I went to the Doctor and asked for help. She wrote me a prescription for anti-depressants and referred me to a counsellor who could assist me in making sense of my turbulent emotions. With time, I regained control of my mental health, my mood brightened and I was more engaged with my family. I began to read my children’s behaviour much better and took pre-emptive steps to divert and avoid their meltdowns before they happened. My neighbour smiled knowingly. She knew full well that children aren’t always to blame when meltdowns and tantrums occur. 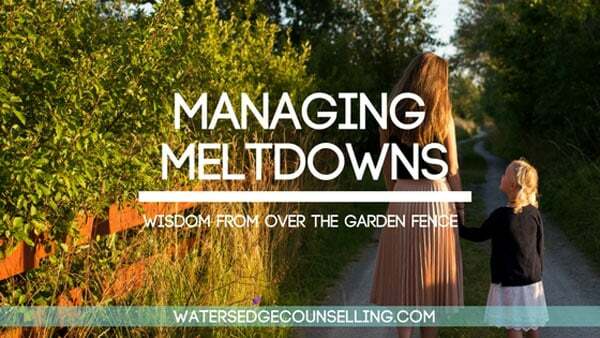 The fact of the matter is, a parent’s state of mind and their ability to respond to their children are actually key factors in avoiding the conflicts and misunderstandings that lead to meltdowns. It was a lesson I had to learn on my own. Five years later, I continue to monitor my mental health, taking medication and seeing my counsellor as needed. It has helped me cope with the passing of my father, an interstate move and more career ups and downs. Despite this, I usually manage to remain the loving, engaged parent my children need. And I can tell you now….there are a whole lot less meltdowns in our house when I am looking after my own mental health! Louise Griffiths is the founder of Exploring All Options, an educational consultancy and tutoring service that provides alternative ways to teach young people in a way that works best for them. Visit her website here. Are your kids having a meltdown? Are you a busy parent who wants to care for your mental health? Call Colleen on 0434 337 245 or Duncan on 0434 331 243 for a FREE 10 minute consultation. To make an appointment, go to BOOK NOW and you will be able to access Watersedgecounselling’s online appointment diary.